The South Dublin Model Railway Club was founded in 1975 to foster the craft of railway modelling in the South Dublin area. In 1976, with very little resources, the club built a layout in 21 days for an exhibition in the Glencree Reconciliation Centre. Around 1980 at the start of construction of the DART system in Dublin CIE commissioned the club to build a model of the proposed DART stations at Dun Laoghaire and Harmonstown. The layout complete with Overhead Catenary and DART trains was exhibited at the Spring Show in the RDS. This layout has been refurbished in 2017 to show how Dun Laoghaire station looked in 1984 when the DART started operation. Other commissioned works were a Christmas layout for Superquinn, Blackrock, Dublin and Westport House Model Railway, Co. Mayo. The club held its first exhibition in Wesley College, in 1979, which was a resounding success. The club now holds a major exhibition every two years over the three days of the October Bank Holiday weekend. The 2015 show celebrated the 40th Anniversary of the founding of the club. The Club has had four different homes over the years and for one reason or another none of them was entirely satisfactory. We could not be sure of a roof over our heads from one year to the next. In 2001 the Club, with assistance from South Dublin County Council, built new clubrooms in Knocklyon, Tallaght. We now have 400 square metres of space over two floors, which incorporates a comprehensive Library of over 1,500 books and hundreds of magazines on Irish, British, European and American railways and model railways. The club publishes its own magazine for members, Parallel Lines. The South Dublin Model Railway Club clg is a company limited by guarantee and its running is overseen by a Board of Directors drawn from the membership. It holds an AGM in late March each year. 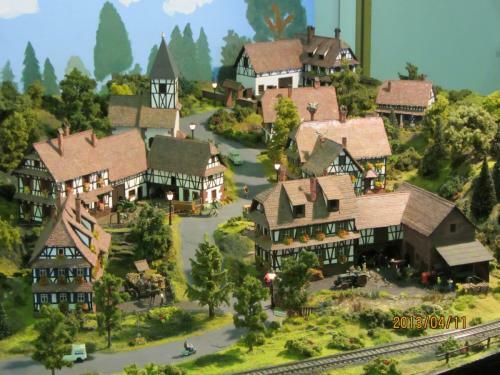 The South Dublin Model Railway Club welcomes new members (persons over 18). Wednesday Night is Club Night (20.30-2300 Hrs). Members meet to operate or work on layouts, meet friends, browse in the Library or talk shop over tea and biscuits. Apart from building and operating Club layouts, members may apply for space to build their own layouts, for operation in the Clubrooms or to take home. Some members cannot afford or have not got the sufficient confidence to build their Layouts. In this case there is no need to worry, help is at hand. An alternative is for members to form a group and apply for space to build a group layout. We cater for modellers of all abilities, so whether you are a complete beginner or an experienced modeller you will fit in straight away.